Minecraft is a popular video game that challenges kids to be productive and creative in a pixelated virtual world. Due to the geometric features of characters and scenery in the game, it transitions well into easy decorating ideas. 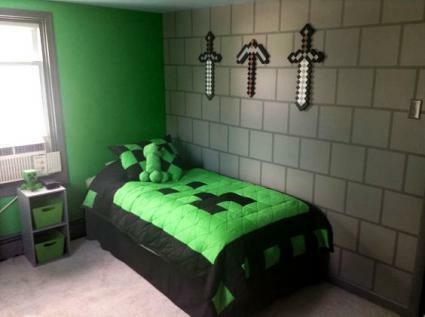 A faux painted concrete brick wall makes a cool backdrop for Minecraft-themed room. Choose a single wall to do and based on the difficulty, you can decide if you want to continue around the room or just leave it at an accent wall. 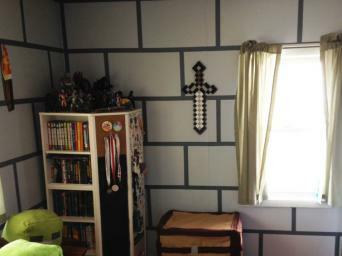 Painter's tape can help you create a faux brick wall. 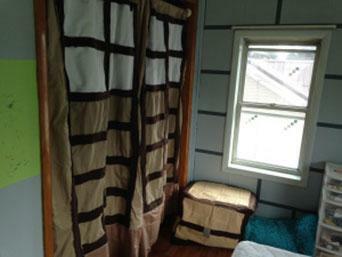 Place your dropcloth down and tape off all trim work and edges. Pour some of the dark gray paint into the paint tray. Load your paint roller and roll on the first coat of paint. Wait two hours and then apply a second coat. Allow the base coat to dry for 24 hours. Tape off the bricks by starting with horizontal lines spaced 14 inches apart. Use the level to ensure the tape is straight running the length of the wall. Add vertical lines, spacing them 24 inches apart. Stagger the vertical lines from one row of bricks to the next, creating a brick pattern. Apply two coats of the light gray paint. Allow the first coat to dry before applying the second coat. Let the second coat of paint sit for several minutes and then carefully remove the tape. Tip: Don't wait for the second coat of paint to dry completely before removing the tape, as the paint might peel. Painter's tape can also be used to create pixelated designs of clouds, grass and earth, as everything has sharp, 90-degree angles. Decals and stickers - From cute little pigs and cows to monsters, creepers and miners coming out of the wall, Minecraft decals and stickers look amazingly three-dimensional. Tunnels looking deep into other rooms can be moved and repositioned without damaging the sticker or the wall. Find them at Etsy and Amazon. Posters - Frame a print of a zombie pigman, game characters or a scene from the Minecraft virtual world by visiting Poster Revolution or All Posters, where you can also have your Minecraft print put on canvas. Wall torches - Although they can also sit on tables, mount these cool torches to the wall or you might never see them again. One corner flips down exposing two keyhole mounting slots, which you can attach to a couple of wall screws. Find them at Target. 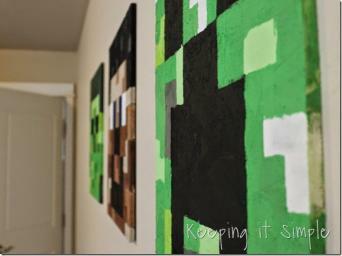 Pixelated faces of Minecraft characters can be re-created on pieces of plywood, foam board or inexpensive canvas board. Just make sure it is square, with equal lengths on all sides. Painter's tape - ½ or ¼ in. Make a grid on the board by marking off equally spaced 1-inch sections (or 1.5 inches if the side length is an odd number) along each side. Use a straight edge to connect your marks going horizontally and vertically. Use painter's tape to mask off sections such as the hair, eyes, nose and mouth. You may not be able to do them all at once if they are touching. Paint in those areas, using the foam roller on large portions and a paintbrush on smaller areas. Once one section is dry, carefully peel the tape away and mask off another section to be painted. Come back later to touch up minor imperfections. Continue painting by masking off sections for different colors until the board is filled in. Attach picture hanging hardware to the back once your painting is dry. Hang the boards as a grouping on the wall. Tip: Look for pictures of the characters online to use as a reference for these easy, geometric faces. Make a similar art project for your kids using construction paper. Draw the grid on a large piece of white paper and let them fill in the squares with colored square pieces. Once they get the pattern right, they can glue each piece in place. Kids Room Treasures - Here you will find colorful quilts and comforter sets with different geometric block patterns but mostly in Full/Queen size. Amazon- Here the Minecraft bedding is mixed in with other stuff but you can find twin size quilts and comforters along with queen size. Etsy - Check here periodically for handmade pillows, quilts and blankets with character faces or pixelated colors. The inventory changes often so if you see something you like, you should purchase as soon as possible. Dress up plain white curtains with pixelated color blocks along the bottom and perhaps going up the side where the curtains meet. Instead of using fabric paint, which usually has limited color options, mix regular acrylic craft paint with a product called Textile Medium. This will turn the craft paint into flexible and washable fabric paint. Cleaning sponges can be cut into small 1-inch squares or use disposable foam finishing brushes with square heads to apply the paint, one color at a time. Use any combination of the colors previously mentioned for walls and bedding. Tip: This sponge painting technique can also be used with latex paint to embellish a portion of a wall or furniture. Make your own Minecraft-themed area rug using FLOR carpet tiles. The square tiles are perfect for the pixelated look of this decorating scheme. Use varying shades of green or brown to represent virtual grass, wood or dirt. Assembling the carpet tiles is very simple. The tiles connect to each other by placing each corner or two sides on a small round disk called a FLORdot, which has a sticky adhesive on one side. Use this easy assembly to design your own area rug or even wall-to-wall carpet if you prefer. FLOR offers free design assistance on the website with pdf instructions on how to assemble patterns and FLORbuilder, a virtual design tool you can use to customize patterns or come up with one of your own. Get creative by updating existing furnishings with a Minecraft theme or make your own decorative accents. Bundles of TNT are used in Minecraft for demolitions and occasionally as a weapon. Bring some dynamite to your kid's room with a red paper wrapped lampshade. Since this will likely be a temporary cover for the lampshade, use double-sided tape to secure the paper. Remove the lampshade from the lamp and lay it on the paper, lining the shade's seam up with the edge of the paper. Begin to roll the lampshade slowly, tracing along the bottom edge with your pencil. Stop when the seam comes back around again. Repeat for the top edge of the shade. Extend the two lines by an inch, so your ends will overlap. Draw a line connecting the top and bottom lines and cut the shape out. Tape one end of the paper cover to the lampshade, preferably along the seam. Carefully roll the paper around the lampshade, keeping it smooth as you go. Overlap the end and secure with several pieces of double-sided tape. Print out large, black TNT letters on white printer paper. Cut the letters out together, making a square label and tape them to the lampshade. Make little bundles of TNT by covering 12 in. high pieces of cylinder shaped foam with red craft paper. Glue pieces of twine or cord to the tops of each "explosive stick" for a fuse. Wrap a long strip of white paper around a cluster of 6 to 8 sticks, labeled with black TNT letters. Toys R Us: here you can find swords and pickaxes made from foam, including one that transforms from a pickaxe to a sword. 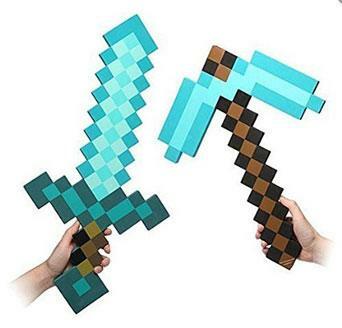 Think Geek: this retailer carries the official licensed foam swords and pickaxes of the Minecraft empire, sure to be of importance to a total Minecraft fanatic. 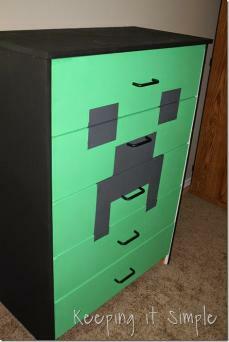 If you're familiar with refinishing wood furniture, paint a Minecraft character face on the front of an inexpensive dresser. Try to find an old dresser at a yard sale or thrift store made from real wood. Don't worry too much if you can only find laminated or veneer surfaces. As long as the dresser is sturdy, the drawers are in good shape and the surface isn't peeling, you can cover a fake wood surface with chalk paint. Remove the drawers and knobs or handles. If you're working with real wood, do a thorough sanding job and apply a coat of primer. Chalk paint doesn't require a primer but a light sanding on laminate or veneer will help with adhesion. Wipe away any sanding residue with a damp cloth or tack cloth. Fill in any deep gouges or scratches with wood filler and sand smooth when dry. Once the surface is ready to paint, the real fun begins. Paint the top and sides of the dresser black and paint the drawer fronts green. Allow the paint to dry for a couple of days. Return the drawers to the dresser. Use low tack painter's tape to outline the square eyes and geometrically shaped nose and mouth (refer to a picture for the shapes) on the drawer fronts. Fill in those areas with black paint. Allow the face paint to dry tacky, about 30 minutes or so. Then carefully remove the painter's tape, pulling gently away from the tacky paint at an angle. Paint the top and sides of the dresser dark pink or red and paint the drawer fronts light pink. Use low tack painter's tape to outline the rectangular eyes, snout and square nostrils. Paint the outer half of the eye black and the inner half white. Mix a small amount of white paint with some of the pink paint used for the drawers. Fill in the snout rectangle with this pale pink color. Fill in the nostrils with dark pink or red. Allow the face paint to dry tacky, then carefully remove the painter's tape, pulling gently away from the tacky paint at an angle. It can take up to 30 days for chalk paint or latex paint to cure fully - letting your kid use the dresser before that could spell disaster for the finish. Apply a clear coat polyacrylic sealer once the paint is dry to the touch and let the dresser rest in a safe place until the paint cures. Fully cured paint stays hard when you press into it with a fingernail. 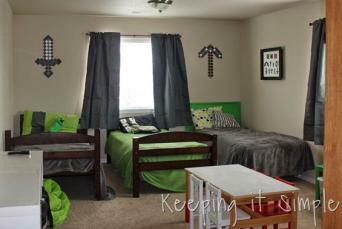 When planning your Minecraft-themed room, choose two or three DIY projects that match your skill set and comfort level. Be sure to include areas of solid colored furnishings in addition to the pixelated blocks of color to avoid overwhelming the room with too many "busy" patterns. Have fun with the theme but keep in mind kids' interests tend to change every couple of years or so.